The green anaconda is a non-venomous boa species found in South America. It is also known as the common anaconda or water boa because it spends most of its time in or around water. There are 4 anaconda species, the Bolivian anaconda, dark-spotted anaconda, yellow anaconda and the green anaconda. 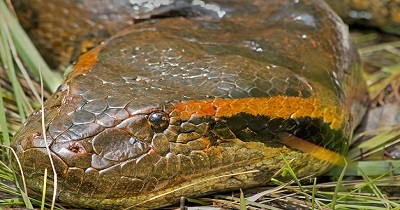 The green anaconda is the best known because of its size and distribution. They are native to tropical South America. They are found mainly in the Amazon basin of Peru, Brazil and Colombia and in the Orinoco basin of Venezuela and Guyana. They are also found in the island of Trinidad. They live in the rainforest near sources of water such as swamps, marshes and low moving streams. The green anaconda is the largest, heaviest and second longest (the longest is the reticulated python) snake species. Its body is covered with glossy scales. The color of its skin is olive green with black circular black blotches along its body. Its coloration provides the anaconda with camouflage undistinguishable from vegetation. The green anaconda has a narrow head with orange stripes on either side. Its eyes and nose are positioned high on the head allowing it to see when swimming without being seen. Females are much larger than males having the largest sexual dimorphism of all snakes. Their jaws have very stretchy ligaments so that they can swallow their prey whole. Green anacondas are the second longest and heaviest snake on earth. Length: 22 feet or 6.6 meters long. Weight: 66 to 154 lb or 30 to 70 kg. Longer and heavier anacondas have been reported but have not been confirmed. Green anacondas are nocturnal animals. They are solitary unless it is breeding season. They are known as water boas because they spend a lot of time in or around water. They are slow when moving on land. In water they are very sleek and move fast. They hunt by submerging their body in water leaving the top of its head on the surface. When they see a prey they strike and coil around its body squeezing it until it suffocates its prey. Green anacondas are carnivorous. They would eat any animal they can overpower including rodents, fish, turtles and birds. Large anacondas can feed from large animals such as tapir, capybara, caiman or crocodile. Large females are known to eat smaller males. After a large meal they can go without food for weeks. Anacondas swallow their prey whole. Anacondas start their reproductive life at around 2 to 3 years of age. Anacondas mate during rainy season from April to May. Gestation lasts from 6 to 7 months. Green anacondas are ovoviviparous meaning that the embryos develop in eggs and hatch within the mother. They give birth to life young usually from 20 to 40. Babies are born life from their mothers and are on average 2f of 60 cm long. Baby anacondas do not require parental care. They are capable of swimming and hunting right after birth. Some young anacondas are eaten by their mothers. Life expectancy in the wild is 10 years on average. Life expectancy in captivity is around 30 years. Adult green anacondas have very few natural predators because of their size. The young are vulnerable to becoming prey. The greatest threat is habitat destruction and pollution of rivers and lakes by the mining industry. Stable population, no considered threatened. 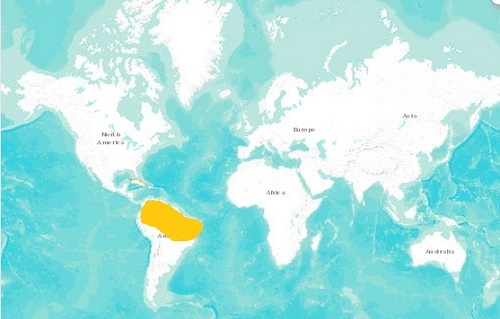 It has not been assessed by the IUCN Red List. What is the difference between boas and pythons? The main difference is how they have offspring. Anacondas are ovoviviparous which means that their eggs hatch within their mothers and babies are born life. Pythons are oviparous, females lay eggs and incubate them until they hatch.